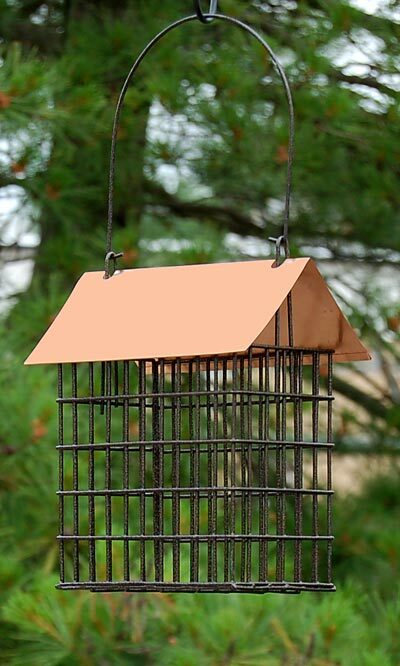 Create an elegant feeding station in your bird garden with the Woodlink Coppertop Double Suet Cage Feeder. Offering suet or seed in a cake form helps attract different birds to your yard, while bringing a variety of feeding options to them. This hardy, all metal unit will certainly withstand the rigors of daily use, while remaining beautiful in your yard. The significant cage holds two standard suet or seed cakes, and the 1" by 0.5" grid enables birds to easily reach the feed. The copper colored metal roof protects the cakes from rain, and the included metal hook extends through the roof for easy placement. Lift the roof up the hanger to refill the feeder when needed. The metal mesh body has a lovely, antique brown finish, further enhancing the elegant feel. Add suet or seed cakes to your feeding options with this Coppertop Double Suet Cage Feeder.